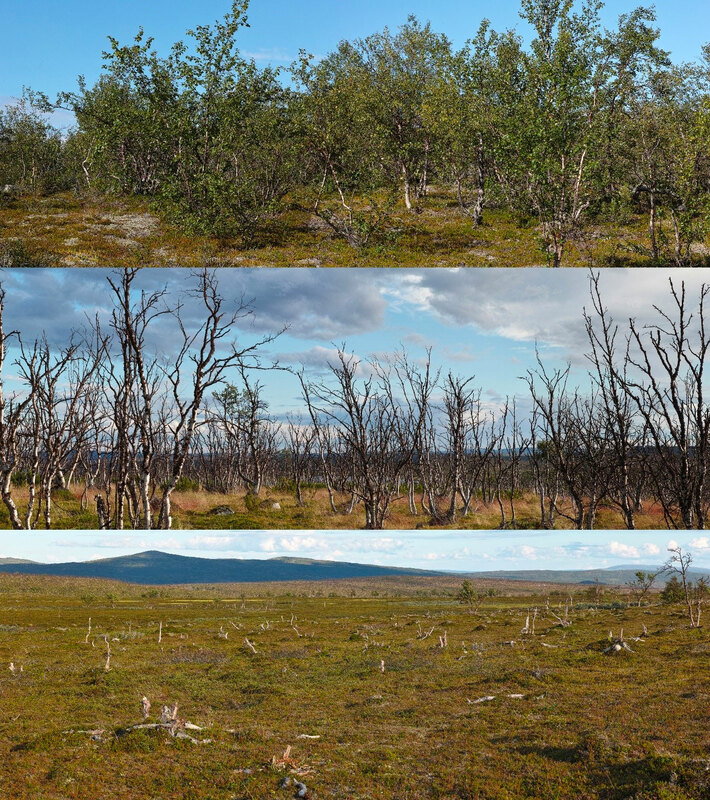 Pest insect outbreaks in the subarctic birch forest of northern Norway are among the most abrupt and large-scale ecosystem disturbances attributed to recent climate change in Europe. But such outbreaks have occurred regularly as far back as historical records go. What is new and why are moth outbreaks a cause of concern? Can damaged birch forest be salvaged? “Salvage logging” of birch stands damaged by outbreaks has been proposed as a means of aiding forest recovery. Logging is expected to stimulate the production and growth of basal shoots from the root system of dead or damaged birches. 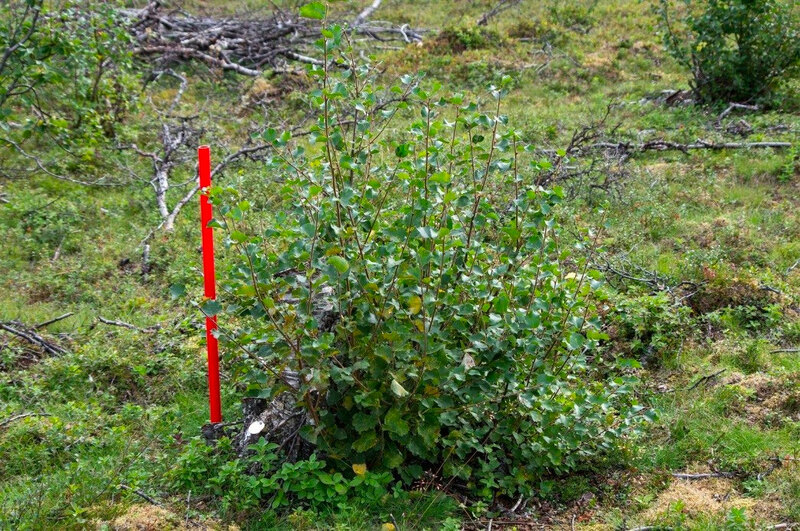 In 2011 we initiated a field trial in collaboration with the County Governor of Finnmark, and the Finnmark Estate Agency, to document these effects in different forest types. Within two years after logging, the number of basal shoots in experimental logging plots was on average four times higher than in untreated control plots. Shoot growth was also improved in logging plots in one of the two experimental regions. In the other region, however, heavy ungulate browsing retarded shoot growth to the extent that shoots completely failed to grow into new stems. Thus, logging can be a useful aid to local forest recovery in areas where ungulates are scarce, but is probably not worthwhile where ungulates are abundant. Moth larvae have “always” inflicted sporadic damage on forests, but the outbreak ranges of the moth species are changing in response to a milder climate. Historically, moth outbreaks in northern Fennoscandia were mainly caused by the autumnal moth – a relatively cold-adapted species. The less cold-adapted winter moth was not recorded north of Tromsø until early in the 20th century. Since then both species have spread into more northern and continental areas. During massive outbreaks after 2000, the winter moth reached outbreak densities over most of the region, far inland and all the way to the low arctic tree line in eastern Finnmark. A third species, the scarce umber moth, has expanded its range northwards in Troms during the last decades, and is now an important pest in coastal forests. Because the different moth species tend to reach their population peaks with a time lag of a few years, more species means longer outbreaks. This is bad news for the birch forest. Forests are dynamic systems able to withstand a certain amount of disturbance such as drought, storms, insect outbreaks or wild fires. After a disturbance, forests recover to their previous state. This ability of an ecosystem to maintain its structure and function despite disturbances is referred to as resilience. However, if disturbances become more severe or more frequent, the ecosystem may no longer be able to recover; the system has reached a critical threshold. In such cases even small, gradual changes in disturbance level may result in disproportionally large and sudden impacts on the forest ecosystem. In the northern birch forest, we have found several indications that such thresholds exist. First, the forest can tolerate defoliation up to a certain level, but exceeding this threshold results in rapid mass-mortality of birch. Second, there is threshold also in the potential for forest regrowth, as recruitment of both saplings and basal sprouts is poor if the mature tree layer is too severely damaged. Critical ecosystem thresholds. 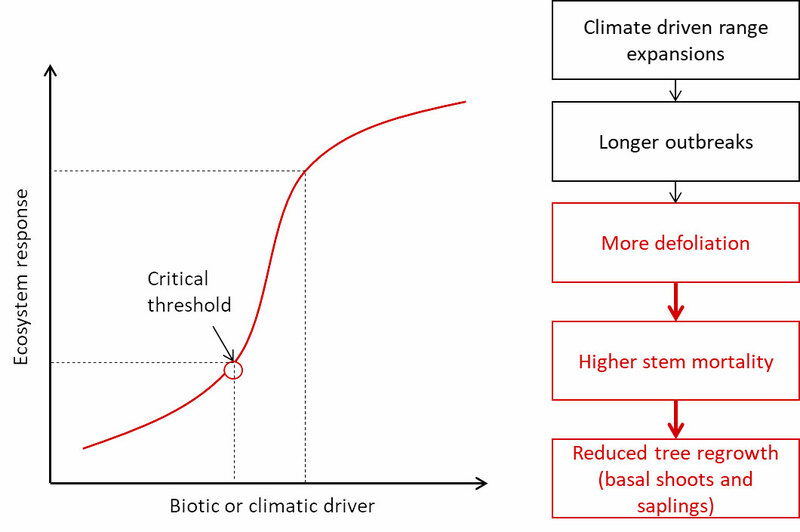 Non-linear relationships between the level of disturbance by a biotic or climatic driver (for instance duration of insect outbreaks), and the response of the ecosystem (for instance tree mortality) indicates the presence of a critical threshold. Beyond the threshold a small increase in disturbance will result in a large change in the ecosystem. For the birch forest, such non-linear relationships have been identified both in the relationship between defoliation (the amount of leaves consumed by insect larvae) and stem mortality, and between stem mortality and regeneration from basal shoots and saplings (red sections of the figure). What comes after the new pest: Ecosystem transitions following insect pest outbreaks induced by climate change in the European high North. Funded by the Research Council of Norway (project 244454), the Fram Centre Terrestrial Flagship, and participating institutions. The moth outbreaks during the 2000s resulted in high forest mortality in Finnmark and northern Finland. Ten years after the outbreak, tree mortality is locally above 90%. Despite this, a new outbreak is currently in progress, which is likely to further increase forest mortality. Such large-scale diebacks are expected to have implications for many forest-dwelling species. In recent years, we have studied the short-term cascading impacts of moth outbreaks on vegetation, wildlife, and biodiversity of birds and insects. In severely affected areas, the ground vegetation underwent a complete transformation from a dominance by dwarf shrubs to grass. This was beneficial for grazing rodents, but large browsers such as reindeer avoided the more severely affected areas. The transformation was also confirmed by snow tracking in spring, when fewer tracks of the herbivores ptarmigan, hare and moose were observed in damaged forest areas. In contrast, forest-dwelling birds appeared resistant towards forest mortality, at least in the short term. This could be related to the structure of the forest remaining largely intact, and may change over time as the dead stems decompose, break and fall down. Deadwood-associated beetles play a key role as decomposers of dead stems in forests further south. In the northern birch forest, we found that their response to the vast amounts of dead wood resulting from the moth outbreaks was limited and dominated by a few species. This suggests that these beetles play a minor role as decomposers of the dead wood left by the outbreaks. Gloomy future for northern birch forests? The intensified outbreaks and the presence of critical thresholds in the response of the forest raise concern for the future of the affected areas. Relatively small changes in defoliation pressure caused by continued moth range expansions under climate warming, can cause very large increases in forest mortality and subsequent recruitment failure. This will drive a transition from forest towards more open or treeless states. However, the behaviour of ecosystems that exhibit non-linear responses, as observed here, is notoriously difficult to predict. 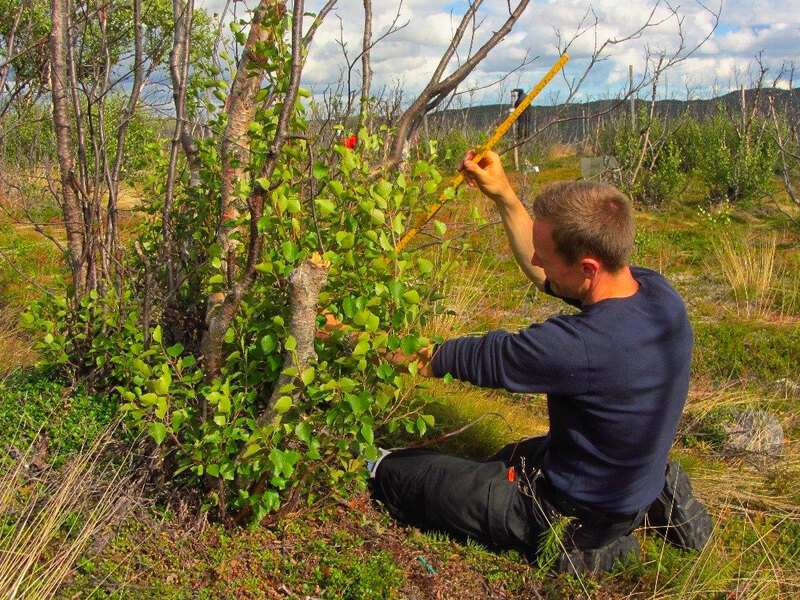 Therefore, focused long-term monitoring of both moth outbreaks and forest responses are needed to understand the implications of insect pest disturbances on the northern birch forest ecosystem. Such monitoring is currently being developed as part of COAT – Climate-ecological Observatory for Arctic Tundra (www.coat.no). An experimental birch stump two years after logging, showing extensive production of basal shoots. The red pole is 50 cm tall. Photo: Moritz Klinghardt / Norwegian Institute for Nature Research.